At present in the field of microelectromechanical systems (MEMS), commercialization has been advancing in wide areas centering around sensors, and the awardee, Dr. Hiroyuki Fujita, has made a great contribution to the development and commercialization in this field, conducting pioneering research from the 1980s at the dawn of this field. And in collaboration with Dr. Hiroyuki Noji and Dr. Gen Hashiguchi, he applied this technology to experimental tools that contribute to bionanotechnology, thereby directly manipulating nano-objects and molecules, and developed an experimental system for measuring and evaluating change in their shape as well as their various physical properties in terms of electricity, machinery, chemistry, etc. Among others, the results of his research as described below are epoch-making and can be highly evaluated. Due to the aforesaid reasons, the three researchers, Dr. Fujita, Dr. Noji, and Dr. Hashiguchi, will be awardees of the 13th Yamazaki-Teiichi Prize in measurement science & technology. MEMS (micromachining) technology that fabricates micro machines by making use of micro-fabrication on a silicon chip is commercialized widely as smart phones and automotive sensors. Controllers for TV games that move the screen by detecting the movement of hands and the body as well as prevention of camera shake also make use of MEMS sensors. Meanwhile in the forefront of science and technology, the world of nano which is one thousandth of a micron has become the focus of attention. MEMS technology is used not only for sensors but also as a tool for scientific experiments at the nanoscale, and it has enabled the shape of a molecule to be presented as an image such as the benzene ring and has enabled one atom to be moved on the surface of a specimen or to investigate the type of such atom. 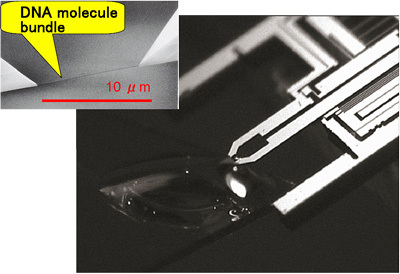 In this study, experimental systems were developed in which a MEMS experimental tool for bionanotechnology was made to provide higher levels of functions and it was combined with state-of-the-art microscopes and systems of measurement, and while directly manipulating nano-objects and biomolecule, changes in their shape and their properties such as electrical, mechanical, and chemical ones were measured simultaneously. （１）	A system for detecting a single molecule by confining it in an ultrasmall container: The principle of measuring a sample having extremely low concentration (example: a cancer marker in blood) is shown in Fig. 1. After having attached marker molecule antibodies to the surface of a very small sphere beforehand, mix them with a sample liquid, whereupon the marker molecules are captured by the antibodies at a probability proportional to the concentration. Next, confine the liquid mixture into approximately one million containers of several microns in diameter that have been made on a MEMS chip. The contents of the containers are of three types: "sphere with a marker," "sphere only" and "vacant." Furthermore, when applying a bio reaction in which only the containers containing a marker are lighted by fluorescent light, the number of containers emitting light shows the number of the "spheres with a marker." 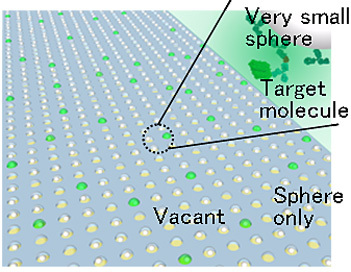 Based on the ratio of the total number of the spheres on the chip to this number, the concentration of the markers contained in the original sample liquid can be calculated. As compared with conventional techniques to be used in a test tube, high sensitivity detection was enabled in which the signal-to-noise ratio was improved on the order of one million times. （2）A system for measuring mechanical, electrical, and chemical characteristics by capturing filament-like molecules of DNA, etc. : A research for measuring electromechanical characteristics was conducted by making nanotweezers (Fig. 2) by means of MEMS technology and by capturing DNA molecules and nano-objects. Immersed the tip of the nanotweezers in a solution of DNA, and drew molecules from inside of the water by means of the force of the electric field applied to the tip, and after having stretched the molecules, fixed them at both ends of the arms of the tweezers in the form of bridging the ends. Immersed a captured DNA bundle into water and by applying a force by means of the tweezers, measured the hardness of the bundle with a resolution at a level of several molecules. When adding a DNA-cutting enzyme into water, the molecule bundle becomes gradually thinner and softer, and this change over time was measured successfully. Fig. 2 MEMS molecule tweezers; on the upper left a DNA molecule bundle that was captured at the needle tip is shown. 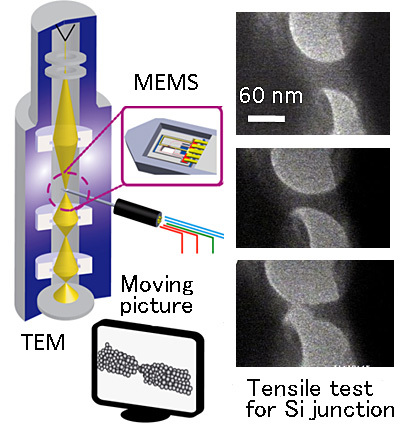 （3）A system for measuring characteristics simultaneously by making an object of several nm by means of a MEMS device in a transmission electron microscope and by observing changes in shape when applying a force or voltage to the object: A tensile strength test for a nano-object was carried out in an electron microscope in which tensile stress was measured by making a moving picture of the situation in which the object is stretched into a thin and long piece (Fig. 3). A result that is just contrary to the common sense in the macroscopic world was obtained such that gold was cut with hardly any stretching and silicon was stretched even to a length that is 20 times its original length. Aside from this it was found that in a junction of several nanometers, thermal conduction increased to a value several dozen times the original value. When investigating biomolecules and nano-objects, a small tool fit for the investigation and an eye for observing details are required. The significance of this research lies in the fact that a microscopic world is elucidated by using a micromachine as the small tool and using an optic microscope or electron microscope as the perceptive eye. It is expected that measurement on the level of a single molecule will create new markets in which biomarkers for cancer, neurological disorders, infectious diseases, etc. are detected in extremely early stages in clinical inspections, and diagnoses are carried out by using body fluids such as urine and saliva that are obtained by a noninvasive method. Also, in radiation therapy for cancer and with some types of anticancer drugs, the DNA of cancer cells is targeted. By applying X-rays or anticancer drugs to the DNA that has been captured with molecule tweezers, their effects can be measured quantitatively. In future, it might be possible that by measuring the effects by using the DNA of a patient, a therapy fit for the patient will be capable of being selected. Lastly, an idea is proposed in which characteristics that appear peculiarly at the nanoscale are utilized to save power consumption of electronic equipment as well as to reduce friction in machinery and to increase thermal efficiency. It is expected that such characteristics will be found and the mechanism of occurrence will be elucidated by using MEMS tools in an electron microscope.